"What is it, Professor?" asked Dr. Kropotkin's young assistant, Maya Majoun. "Remarkable, Maya!" exclaimed the Professor. 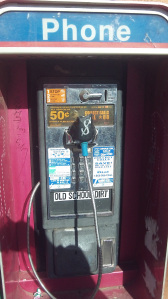 "I believe this is an extremely rare fossil find of the extinct species known as Publius Telephonis. I've never seen one before!" "Never heard of it, Professor. When did they thrive?" "They roamed the planet freely throughout much of the 20th and early 21st centuries, then mysteriously vanished!" "We don't know, Maya, but we think an enormous meteor struck Earth, wiping them out." "Look over here, Professor! Smaller variations with the words "I-Phone" and "Samsung" on them!" "My God, Maya! Publius eggs!" Hold the phone, everyone! With the Friday Fictioneers picture prompt up top and my story below, I called in with exactly 100 words this week, precisely the amount the Professor (in this case, Rochelle Wisoff Fields) assigned. You can strike many more finds most rare based on the prompt above if you plant your shovels and other tools of archaeological exploration right here. Dig in, folks. Have a good weekend, and don't forget to guard your publius eggs! Thanks, these little Samsungs are just everywhere! I laughed. Which is good! How wonderfully creative. Loved this. You nailed the dialogue, Professor Block! "Better to hold the phone than to get a kidney stone." Publius eggs ... HAHAHAHAHA! Terrific work, Perry! Great ending, too! Perry< this was a stori-acus magnifi-centus!!!!!! Bravo-us!!!! You laughed at my stuff. Which is better! And they make terrific Eggs Benedict too. Thank you, Penny, but I think you could have used at least one or two more derivatives of "funny" in your comment. You like it that much to call me "darling?" I knew my comedy would one day get me some chicks! Thanks, Beth, but it's Maya Majoun and the Professor nailed the dialogue. I just channeled them. Never knew you were so interested in paleontology, Janet! Well, thanks, I try to leave 'em laughing. Mostly, though, they just leave me. You've welcome for the laugh. I do expect it back when you're done with it. The banter on this reminded me so much of Mr. Peabody and Sherman in those old cartoons on Rocky & Bullwinkle. Which a compliment, as I am a huge fan of the moose & squirrel. Don't be fooled. That wasn't Helen. It was Lisa Douglas from Green Acres. I'd recognize that accent anywhere. I'm sure this find will soon be on display in the museum at Havertown University. Well done, Mr. Peabody. Great bit of ancient humor. Mazel tov on doing it in only 100 world. Has a nice ring to it. I always like my eggs LOL too! Yoke's less runny that way. I'm old enough to remember when Moose and Squirrel debuted in black and white. I'm glad that "now here's something you really liked!" Thank you, Mr. Sherman. The University of Havertown, being a diploma mill, won't be able to afford it or the eggs. And ain't Fridays grand when I get so many lovely comments on my posts as opposed to every other day when I'm lucky if I get one ... namely YOURS! And the two down home curators like your comments too! Keep chuckling. Don't let them hear you say that or they'll pummel you with their paleontology notebooks! Yes, Maya and I were resolved to get this one to fit. The Professor is a little verbose (not I!) so the two of us teamed up to quiet him down. Now he's yakking over those eggs nonstop about his find! A rare find, indeed. There will be lots of fun stories to read from this prompt. I'm just getting started. Don't let me hold you up! I'm glad you like that, because it frightens some people that they once ruled the earth! Clever and funny, what's not to like! Odd, but people that know me seem to find plenty. Thanks for writing! Egg-sellently constructed indeed! Thanks for the laughs. Thank you, Anne. You're the apple of my eye!